Shayna Roth-Pentecost is one of our acclaimed glass artists in our year-round store! Since the first moment Shayna witnessed a glassblower at work she recalls being mesmerized by the grace and beauty of the craft. Her journey with glass began at the Cleveland Institute of Art, followed by her move to North Carolina to enroll in workshops at Penland School of Crafts. 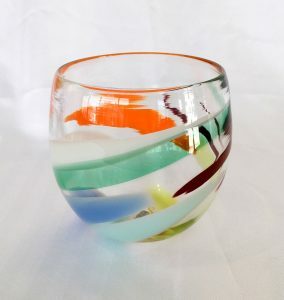 She has studied and apprenticed with many world renowned glass artists. Currently, Shayna is working and teaching at Superior Hot Glass in Cleveland, Ohio. The inspiration for her art comes from her love of the whimsical and imaginative expression found in folk art, the sophisticated work of the modern abstract movement, and her amazingly creative children. Shayna plays with the colors and textures of glass to create simple yet unique forms. Enter for your chance to win Shayna’s beautiful hand-blown bowl for FREE with the completion of an in-gallery raffle ticket!